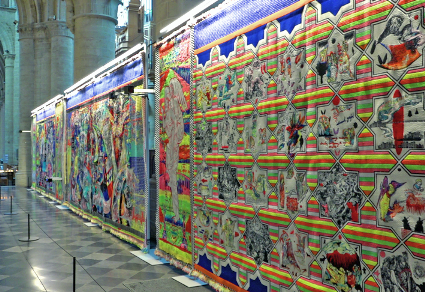 Irene Barberis’ 36m long tapestry of the Apocalypse is a major achievement, presently displayed for the first time at the Cathedral in Brussels. For over ten years the internationally established British/Australian artist has been preparing this monumental work of art. She insists it is not an illustration but an evocation of the Book of Revelation. Her aim is not to offer a visual narrative of the 22 chapters of the last book of the Bible. Her purpose is rather to invite the viewer to discover and interpret a series of images in the light of our contemporary culture. Mixing artistic quotations from the Angers Apocalypse, Giotto, El Greco, Dürer and medieval Apocalypse manuscripts with contemporary imagery, Barberis conveys the perennial message of the text, which appears in full at the top of the tapestries. The title of her artwork indicates her conviction, shared with the author of the Book of Revelation, that after suffering and violence, the heavenly city will come down from heaven bringing peace and divine light. Indeed, far from being a chronological narrative evolving from the beginning to the end of times, this biblical text, written at the end of the first century in a period of persecution of the Johannine communities of Asia Minor, is about the end of the extant world of violence. It is about comforting and encouraging the early Christians in the light of the events of the death and resurrection of the Lamb of God, so as to keep their hope alight in adversity. Barberis is not first and foremost interested in bringing a visual catalogue of dark apocalyptic events, however fascinating they may be and however attractive they have been to artists throughout the ages. They are of course present in the fourteen tapestries, as violence and evil are part and parcel of our world, but Barberis’ ambition is rather to offer glimpses of light in the midst of this suffering and to strengthen the hope that in the end God will conquer death. Revelation is another central theme to her impressive work. Using technological innovations which have recently been introduced in weaving, Irene Barberis proposes to read her work under three different lightings. Under natural light, UV-light (use of fluorescent threads) and by night (use of phosphorescent threads), the tapestry offers different appearances, alluding to the process of revelation which gradually allows the reader to discover the riches of a text. This threefold approach highlights the symbolic and metaphorical literary style of the Book of Revelation and urges the viewer to reject a literally reading. After the series of tapestries by Jan Bondol (1380), Barend Van Orley (1520) and Jean Lurçat (1956-1961), Irene Barberis offers to the 21st century its own Apocalypse tapestry. Its roots in the artistic tradition, its contemporary approach taking into account the exegetical expertise of today, the use of innovative technologies and of images specific to our time, as well as the fact that for the first time a woman artist has embarked on such extensive visual evocation of the Book of Revelation make the Tapestry of Light a milestone in the iconographic history of the Book of Revelation. Through her work of art, Irene Barberis invites the viewer to rediscover a profound text which was written to fuel the hope of mankind. Irene Barberis: Tapestry of Light, 2017, 14 tapestries of in total 36 m x 3,20 m, wool, cotton, fluorescent and fosforescent threads. Woven by Flanders Workshop, Wielsbeke-Waregem (B). 28 April – 15 June, Brussels Cathedral: Tapestry of Light. Intersections of Illumination. Irene Barberis is an international artist born in 1953 in Chiswick/London, England, residing in Australia. She has held over 60 solo exhibitions, 90 group shows and her work is collected globally. She holds a PhD from Melbourne University titled Abstract and Figurative Elements of the Apocalypse and its Representations. Irene has received multiple prizes and commissions. Barberis’ curatorial, published works and initiatives through Metasenta® and the Global Centre for Drawing include Art and University projects in the UK, USA, the Middle East and Far East. Publication: Irene Barberis, Tapestry of Light. Intersections of illumination, Thames and Hudson 2017. Alain Arnould OP is Chaplain to the artists in Brussels, a post joined to the St Michael and St Gudula Cathedral, Brussels, Belgium. Each term the ambulatory of the cathedral hosts an exhibition of contemporary art. Alain Arnould OP is in charge of the program.